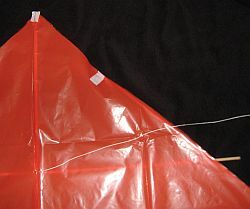 Learn how to build a Delta kite with these easy-to-follow instructions. Fully illustrated with photographs, every step of the way. 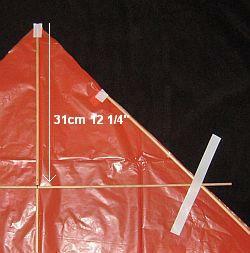 The steps are easy, hence this simple Delta kite comes together very quickly! We still take out the Simple Delta occasionally. As long as the wind isn't too strong, it's as much fun as any similar-sized shop Delta. It hovers at a steep angle on the end of our Dacron flying line. Let the line out to 90 meters (300 feet) or more, if you want to! 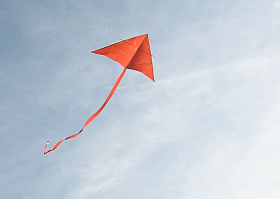 Or, down at a beach in a sea breeze, this kite will hover reliably on quite a short line. Put some sand into a bag to act as an anchor. The kite does best in quite light wind, so be prepared to add some more tail if you're trying to fly in a fresher breeze. 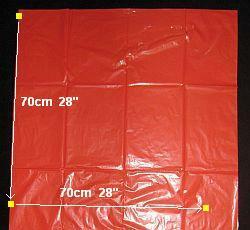 Starting from just below the top-left corner of the bag, measure and mark 3 dots on the plastic. I've high-lighted the dots in yellow, in the photo. Judge the horizontal direction by eye. If you're careful, there's no need for a T-square. Take your scissors and cut along all the black lines. 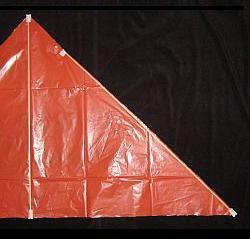 As in the second photo, your Delta kite sail is nearly complete! Take some 5mm (3/16") dowel and cut off a 70 cm (28 inch) length. Lay this down the center line of the sail. Now cut off 2 more lengths, each 80 cm (32 inches) in length. Lay these down over the leading edges of the sail. Using 6 pieces of insulation tape, each 5 cm (2 inch) long, stick them down in the positions shown in the first photo, above. 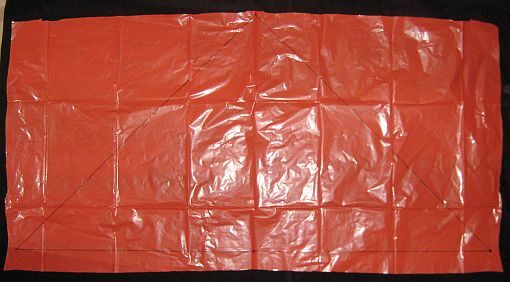 Fold all the tapes around to the underside of the plastic. See the second photo, above. 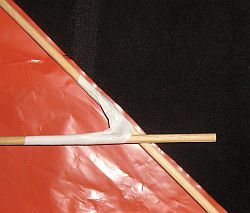 Cut off a 70 cm (28 inch) length of dowel and lay it across the sail, 31 cm (12 1/4 inches) from the nose. 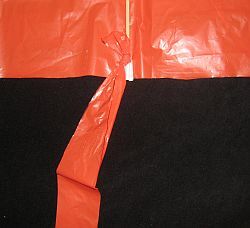 Using 2 pieces of insulation tape, each 20 cm (8 inches) long, lay them over the crossing points. See the first photo, in the group of 3. Carefully wind the tapes around the dowels, without getting them stuck to the sail! Now, each join should look like the second photo. 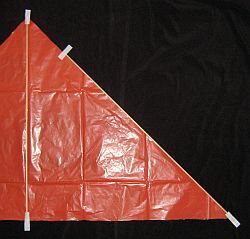 Add an extra tape to the middle of each leading edge, to help keep the sail in place. Also tightly wind an 8 cm (3 inch) piece of tape around the spar join. See the third photo, which was actually taken after some test flying in strong wind! Get your flying line, which I'm assuming has been wound onto a spool or winder of some sort. 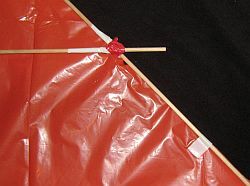 Poke a hole in the plastic sail, right over where the horizontal and vertical dowels cross each other. Thread the flying line through the hole, and tie it firmly around the vertical spar. Do NOT tie it around the horizontal spar! This dowel floats free while the kite flies. 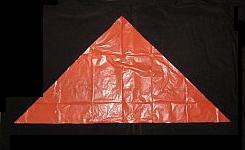 From spare scraps of sail plastic, make up a long narrow strip no shorter than 4 times the length of the kite itself. The strip should be about 5 cm (2 inches) wide. Thread one end of the tail around the bottom of the vertical spar, as you can see in the photo. Tie the tail to the dowel with a simple knot. Hope you enjoyed learning how to build a Delta kite! Up there is another shot of our original Simple Delta doing it's thing on a cloudy day with plenty of sun and just enough wind to keep the kite flying. That's it, you're ready to fly. 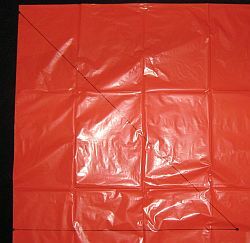 Take the kite out whenever you can see leaves moving in the trees or bushes. 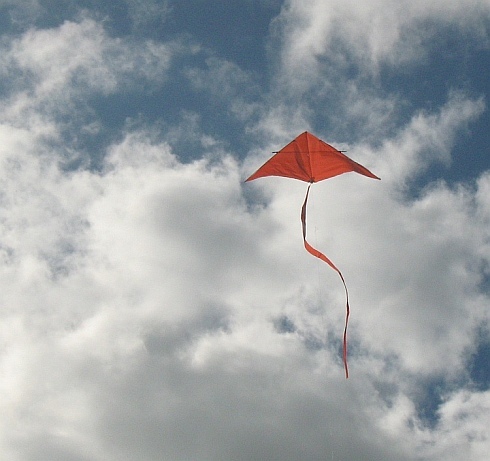 If the kite won't stay up, try letting out plenty of line and then towing it up at jogging pace. It might find enough wind higher up! Such a simple kite and yet it flies so high in a light breeze. The video above shows this kite coping with fresh gusts that are nearly too strong for it.